Horizontal bands in masonry buildings are seismic bands consisting of reinforced concrete. 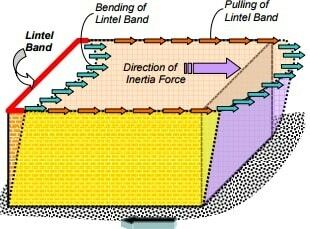 Types of horizontal band, their location, design and applications are discussed. As the demand for masonry buildings is still a prominent method existing for building construction, it is necessary to bring up with additional innovations to make them perform more resistant towards the seismic demands. From past records, it has been seen that a higher rate of masonry buildings undergo sudden collapse under earthquake motion. This is due to its brittle property i.e. it has no appreciable ductility stages. One of the most important methods of increasing the seismic resistance of masonry buildings is by the incorporation of horizontal bands. The use of horizontal bands will help all the elements to be confined together as a single unit. This would have a total resistance from the whole building, other than having an individual contribution. What are Horizontal Bands in Masonry Buildings? The horizontal band can be defined as a method of reinforcing the masonry buildings by providing bands with higher tension strength. This is enabled in areas where two structural elements of a building meet, so that a connection is formed all together and they would behave like a single unit. Horizontal bands can be also termed as seismic bands which consist of reinforced concrete running flat throughout all the external and internal masonry wall elements. The requirement of horizontal bands in roof level is not necessary if the roofs are reinforced concrete or reinforced masonry slab units given that they have a depth of 2/3rd wall thickness. 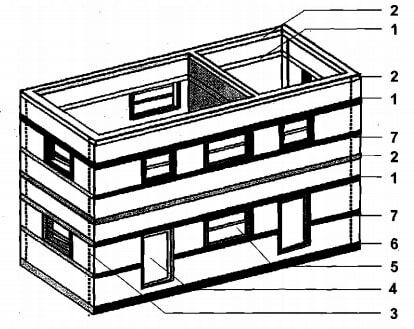 The figure below depicts the important elements of an earthquake resistant masonry buildings. This type of horizontal bands is essential in those areas where the soil on which the building has to be constructed is weak. The soil will be soft with uneven properties. This problem is mainly found in soils found in hilly areas. This band is hence not necessary if we have a stronger soil and substructure. As the names tells these are horizontal bands provided at the lintel level. And it is provided in almost all buildings. 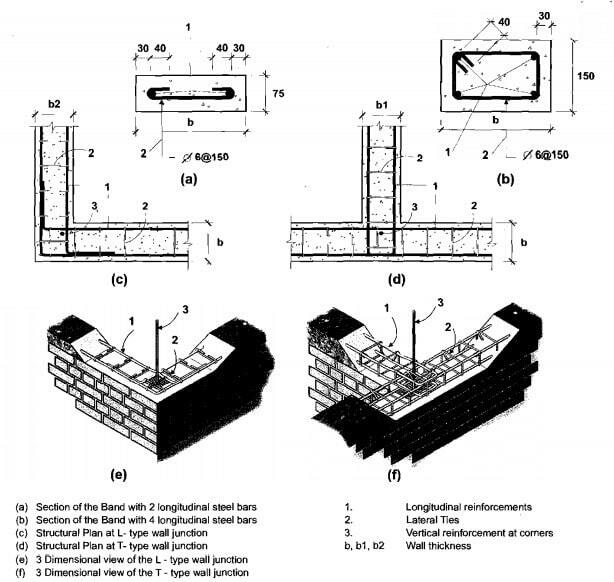 Under the action of earthquake ground motion, the lintel band is subjected to constant bending as well as pulling as shown in figure 2. Hence the construction of lintel band has to done with special care and supervision. These bands are mainly employed in buildings with roofs made of flat timber or CGI sheets. If the building roof is made of reinforced concrete slabs or brick roofs as mentioned before, there is no need of these bands. As R.C slabs itself behave as a horizontal band. Those buildings that have sloped roof i.e. truss construction, gable bands are necessary. Now the incorporation of Gable band is not shown in the figure as the building have a flat roof. When the roof construction is by using a truss, the requirement of gable band comes into play. The recommendations on the design of horizontal bands are provided by IS:4326-1996 Code of practice. This is applicable for the buildings from brick or concrete block walls and also those with RC flat slab roofs. The dimension of the horizontal band and the reinforcement details depend upon the length of the walls which is between the perpendicular cross walls. The details of the dimension of the band and its reinforcement details with respect to the wall thickness for buildings with different functionality is shown in table-1. These recommendations are for buildings located in Zone 5, as per Indian code. The details of sizes and recommendations of bands are provided by Indian Standards IS 4326-1993 and IS 13828(1993). The bands used can be either wooden material or reinforced concrete. R.C bands are the best ones. A minimum of 75mm x 38mm is used for runners and 50mm x 30mm minimum for spacers as shown in figure 4. When reinforced concrete bars are used , at least 75mm thickness has to be provided. A minimum of two bars of 8mm diameter is required that is tied across with the help of steel links. The steel links , with a minimum of 6mm diameter with a spacing of 150mm center to center distance, is incorporated as shown in figure 4.